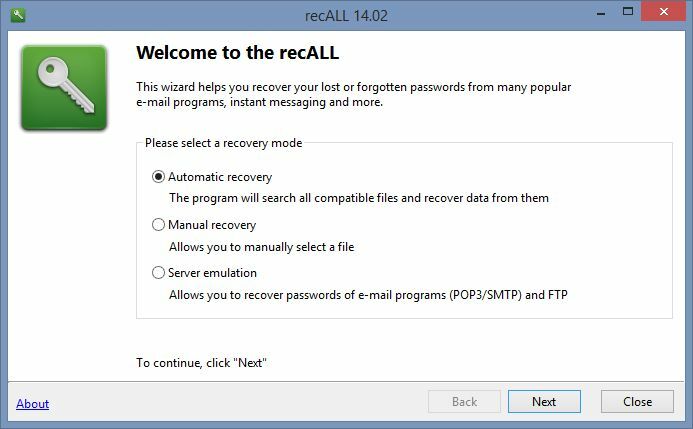 recALL allows quick recovery of passwords from more than 160 programs (email, web browsers, instant messengers, FTP clients, wireless, etc) and license keys from nearly 800 applications. recALL it the world's first program that allows you to recover most of the password and also a license from damaged operating systems through native support of the systems registry files Windows. Due to the unique function emulation FTP, POP3 and SMTP you can recover passwords from any application supporting these protocols, even if the program is not yet supported inrecALL. The list of recovered password can be exported to CSV, Text, HTML or ZIP archive.